A tour to Albania, devised to explore a barely known destination and to experience its history, traditions and people. A tour which offers its participants the unique possibility to listen and understand centuries old folk music and most importantly learn the folk dances of this small but very diverse cultural melting pot, with professional lead dancers of the National Ensemble of Folk and Dance. The roundtrip will start with a traditional welcome dinner in one of the traditional restaurants in Tirana. Overnight in Tirana. Today is a learning experience of some of the folk songs and dances we will experience during the tour. There will be Albanian folk dance in the morning and then a traditional lunch. After lunch we take a tour of the major sites and visit the National Historic Museum which gives an in depth introduction into Albanian history and culture from antiquity to present time. Dinner at a local restaurant. Overnight in Tirana. Today we will continue learning some of the Albanian folk songs and dances. There will be Albanian folk dance classes in the in the morning and in the evening with some of the most experienced leading dancers of the National Ensemble of Folk and Dance which have won many prizes in Albania and abroad. During the break of the middle part of the day visit of the National Gallery of Arts and then lunch on your own. After lunch you will return to continue the learning process of Albanian folk dances. Dinner at a local restaurant with live music where you will be able to showcase your newly acquired skills. The best performers will be issued encouraging prizes. Overnight in Tirana. Today the tour continues from Tirana to Elbasan, the old Roman town of Scampis, one of the towns along the Via Egnatia connecting Rome through the Via Apia with Constantinople, where the ethnographical museum located in a traditional house will be visited. Continue to Pogradec at the shore of Lake Ohrid, where we will visit the Drilon natural oasis and the Villa of the ex-Albanian dictator. Have lunch in a family run restaurant with home cooking (optional). After a walk around Drilon with lush vegetation we depart for Korca one of the most important towns of South East Albania, where the first school in Albania was founded and is now a museum of Education. The Han I Elbasanit is one of the remaining inns from the Ottoman period. Traditional dinner with famous Korca town serenades music at traditional restaurant. Overnight in Korca. Next day will be visiting Voskopoja which once was a major city with a monastery and more than 26 churches, now a rural place. The region is one of the centres of the Vlach or Aruman people, with their own language and traditions. A family lunch in Voskopoja (optional) and a visit to the one of the better preserved churches. Return to Korca where dinner is in the traditional restaurant accompanied by a Saze playing and singing group from Korça. Saze is a clarinet type instrument widespread in Albania but especially in the south eastern part. Overnight in Korca. From Korca a long trip takes us to Permet along the beautiful plain of Korca, valleys of Erseke and forests of Leskovik. The spectacular Vjosa canyons accompany us from Leskovik to Permet, which is the “Mecca” of Albanian Tosk music with many famous singers and musicians like Laver Bariu, the Lela family, Eda Zari a famous jazz singer who has successfully combined the music of this town with jazz, becoming famous especially in Germany but with successful performances in New York, Chicago. Lunch is optional at a restaurant in Leskovik. Dinner in Permet will be obviously a musical affair with performances from a local music group. Overnight in Permet. On the program today is a short walk of 20-30 minutes in one of the villages of Permet housing a wonderful church St Mary Church, with incredible frescoes. Leusa is a traditional village made of stone where we will visit the church and a local family where we will experience an authentic way of life. In the afternoon in Permet we will meet the folkloric group of the town for a talk and again will be able to enjoy the traditions of the talented musicians of this town very rich in folklore while having dinner at local restaurant. Overnight in Permet. Today’s travel takes us through the breathtaking Kelcyra gorge, to the town of Gjirokastra - a UNESCO World Heritage Site due to its attractive and particular architectural features. It is also the place where Albania’s national Folkloric Festival from within the territory of the country but also from outside where ethnic Albanian dwellings exist, takes place once every 5 years. The town is built on the slope of a hill and is known for its characteristic and narrow coble stone streets. The dwelling houses have the form of medieval towers consisting of a building ensemble with characteristic architecture. The town was besieged and captured by the Ottomans in the 15th century, but unlike many other towns in Albania it flourished under its new rulers. The castle stands like a balcony over the city and it enables the visitors to enjoy a very a powerful architectural panorama. Traditional dinner will be accompanied by a polyphonic Group from Gjirokastra. The phenomenon of Albanian folk iso-polyphony has been proclaimed by UNESCO a "Masterpiece of the Oral and Intangible Heritage of Humanity". Overnight in Gjirokastra. Depart to Berat a town more than 2400 years old, with a mixture of cultural influences and one of the most attractive towns in Albania. Berat is situated at the foot of Tomorri Mountain and on the shores of River Osum. It is famous for its white-washed houses with their many windows which, seem to have been build on top of each other, that give it the nickname “town of a thousand windows”. Because of these the town retains a unique style of architecture, with narrow and stone paved streets. The castle is the only one in Albania which has houses and inhabitants within its walls, going about their daily life in exactly the same place their predecessors did for centuries. Visit the Fortress, Onufri Museum and some small old churches remaining in the castle out of 40 it had in the past. Onufri was an Albanian master painter of the 16th century who painted many church icons in Albania and Greece and is famous for its red colour named after him. After visits you are left free to sample the delicious cuisine of this town. In the downtown we visit the Leaden Mosque, the King's Mosque, the Bachelor's Mosque and the Alveti Tekke. We also pay a visit at a local house. Dinner is a traditional feast at Mangalemi with local folk musicians providing the atmosphere. Overnight in Berat one of traditional houses turned hotels. After breakfast the group will drive to Kruja, the centre of Albanian resistance against the Turks under our national hero Scanderbeg. He kept them from crossing into Western Europe for 25 years, thus earning the title “Protector of Christianity” given by the Pope. 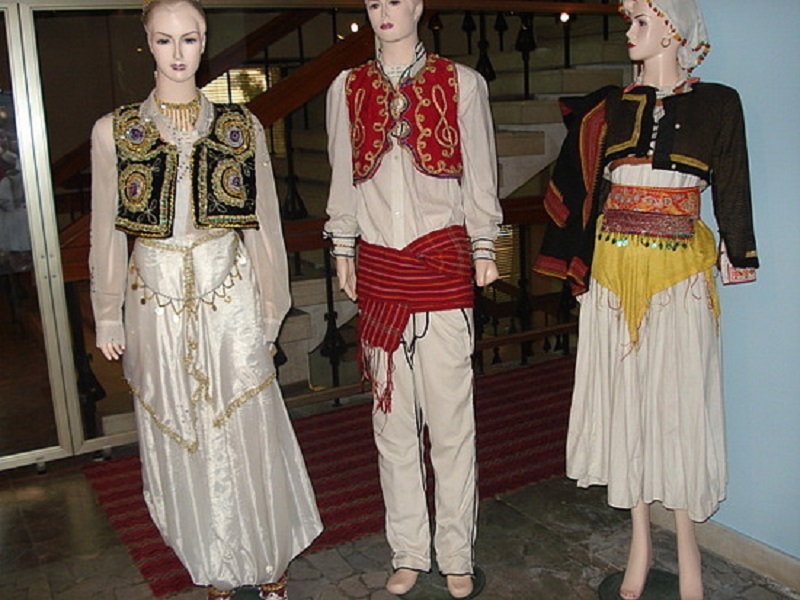 We visit one of the most beautiful ethnographical museums of Albania, packed with lots of folk dresses, utensils, furniture etcetera. After the visit participants can shop in the nearby old Turkish bazaar, where folk dresses, antiques, books and souvenirs of traditional handicrafts can be acquired. Have traditional lunch in Kruja Castle where several good traditional restaurants are located (optional). In the afternoon return to Tirana for a driven tour of the capital. Have dinner in local restaurant where different Albanian chefs come to showcase their skills. Overnight in Tirana. After breakfast relax until time of transfer to the airport where you will surely feel sad to depart from such an energizing and friendly place and yet will fill accomplished having learned some of the most ancient traditional dances in Europe. *Seminar Extension (optional) For those who find the experience was not quite enough we have even more in store. The Seminars to learn Albanian Folk Dances can be extended for 2 more days in Tirana. You will continue to perfect your dancing skills with our two maestros of the National Ensemble of Folk. Ask our staff for the cost of this learning extension. Supplement for staying in a double room for single occupancy will be 190 Euro. Transportation with luxury a/c vehicle.19+1 seats production years 2010-2013. Experienced English speaking tour leader, knowledgeable in Albanian history, antiquity and traditions. We really enjoyed this trip. You were an excellent guide. You were knowledgeable, entertaining, well-speaker, friendly and patient. You were perfect. We really came to appreciate and love Albania – a wonderful country and wonderful people. Best wishes for you and your career and your family. I will always recall your fanny stories when I think of Albania. I truly appreciated your being so informative, helpful and patient (good at - herding skills!) May you live long and prosper Cheers P.S. I liked that you did not lecture all the time on the bus, so there was some quiet time too.